(Meyers Konversations-Lexikon, 4th ed., IV , 998, as already above from XIV, 975, too). See also the quite substantially simplified drawn version by Nicolas Poussin Rosenberg-Prat 208 in Windsor Castle (inv. 11992; 9¾ × 12½ in [247 × 318 mm]) of maybe about 1636 following an antique gem and Virgil’s (70-19 B.C.) Georgica (II, 384) which is just about holding the balance on the oiled skin at all, namely standing on both feet and without wine bowl. Plumbago drawing on vellum. 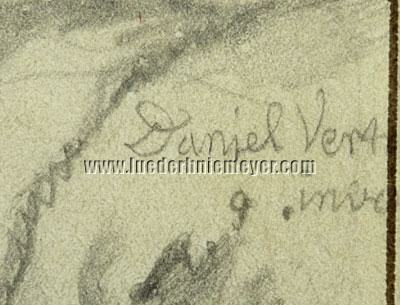 Inscribed in two lines lower right: Daniel Vert / g .inve. 13⅛ × 15½ in (333 × 395 mm). “ so also his drawings are treated very delicately ”. Both sources also otherwise quite contrary to Thieme-Becker who consider him as mere imitator of his master Cornelis van Poelenburgh (about 1586-1667) and adhere to Woermann (1879/88) by his statement “less clear and delicate in the tone and in the treatment”. Just as then also Bernt censures the as against the master a little clumsy figures and the lack of the “atmospheric of the southern landscape and (the) liveliness of the accessories”. (from Getty Provenance Index, Sales Catalogs). (Allgemeine Deutsche Biographie I , 487 ff.). comes up with still a completely different attraction . from about 1620 (Rosenberg, P. P. Rubens – Des Meisters Gemälde [Klassiker der Kunst V], 2nd ed., 1906, pages 211 [ill.] & 474 [“Supposedly executed with the co-operation of van Dyck”]; Staatliche Museen/Beschreibendes Verzeichnis der Gemälde im Kaiser-Friedrich-Museum … , 9th ed., 1931, page 409, no. 776B with ill.; Bernhard, Verlorene Werke der Malerei, 1965, page 20 of the catalog with ill. 130), as documented here probably for the first time. The rearranged adult group yet reduced from seven (seventh, far right, according to Rosenberg with the features of Isabella Brant [1591-1626], Rubens’ first wife) to five with panther, three of which matching type. Newly introduced two bacchantes, one of which with a suckling at the breast. Rubens’ four putti, however, raised to six, the respective group of three in front of Silenus quite similar in arrangement and occupation. Virtually identical the isolated urinating putto, set alone on the right and repeatedly used by Rubens, with Vertangen the far right of the group, yet turned to two further putti, one of which riding the panther – with Rubens instead of this with its forepart only a tiger leaping into the picture from the left as not belonging to Silenus, although certainly his simultaneous (about 1615-1622) Nursing Tigress holding grapes in Vienna (Rosenberg p. 131) – and by this distracted from the said other need. The posture of Silenus quite identical with stronger accentuation of his drunkenness with Rubens, more bent forward and rather stumbling than walking, than with Vertangen, who instead has him far more visibly supported by two bacchantes, just also by the one with the merely raised tambourine, with Rubens occupied with its playing only and placed on the other side. the more or less open borrowing of parts from the works of others . All centuries of Netherlandish painting present examples for that in profusion . Vertangen developed a much more far-reaching composition sui generis . of the theme, his easy-buoyant stringing together of everything found rather apart elsewhere. As for instance his youthful Bacchus with the drinking bowl in the raised left, but also the drinking bacchant below far left as can be called up on the Petersburg Bacchus (Hermitage Catalogue 329 & Rosenberg p. 438) come across again, the latter fatter though, visibly older and with the drinking bowl in the raised right having poured wine. On the right of him then again the little urinator from the lost Berlin group picture. Unfounded from the view here that Vertangen’s present Bacchanal irrespective of its signature – without reservation then also Lempertz 856 (advice for Netherlanders 17th century: Willem van de Watering [formerly RKD]), lot 1377 as The Triumph of Bacchus … – is recorded by RKD (39259) as attribution only. Presumably based on the inve(nit = has invented) instead of the fec(it = has done) prevailing in the Netherlandish 17th century by far. What nevertheless does not hold good. 203, Dusart, fec. et inv. / 379, Maes, inv: et del / 489, Quellinus, invent / 537, Schellinks, ivnt or similar. Or among prints Jacob von Ruisdael’s in. f. in the etchings Wurzbach 6 + 11, see their illustrations in Slive, J. v. R., Master of Landscape, Exh. Cat. 2005/06, nos. 108 + 101. And a downright exemplarily unregulated application of signing is to be found in Schäfke (ed. ), Wenzel Hollar – Die Kölner Jahre. Zeichnungen und Radierungen 1632-1636, 1992, with fecit. at first likewise dominating within the sets of etched costumes & and single figures, here of interest Sch. 41f, 41n, 42h, 53 f. (Parthey 1653, 1661, 1844, 594, 595) for W.Hollar inv: from 1635, 1636, 1643 as well as Sch. 60 (P. 2005) for W.Hollar inu: 1635. Besides then again fec., here and there also sculps(it = has engraved). And if it were about other third-party designs inv. for those, paired with the fec. of himself. However, also the unconventionally stretched arrangement of present Vertangen signature is not out of the ordinary and catches up with the V. T. G. F. in Heller, Nagler (V, 1401) & Wurzbach, besides corresponding with the Karel dv / jardin / (1)658 of drawing Bernt 195, in turn placed sharply laterally. Besides Vertangen – cf. Wurzbach – by no means applied to a uniform signature and signed now in majuscules (capital letters), now in upper/lower case letters, now with full given name, then this only as D. or omitting entirely and in the Schwerin Diana with her Nymphs “Daniel Vertange” (sic!). And besides: why should another person sign in a manner which if necessary might raise attention? Just in case noted here on the signature further that its tails (only?) are covered by the edge lining. ( Sluijter-Seijffert , op. cit., page 446 ). The provenance specification Hella Robels stated by RKD indirectly for the drawing incorrect and also not professed by aforementioned Lempertz catalog fed from several collections as source. 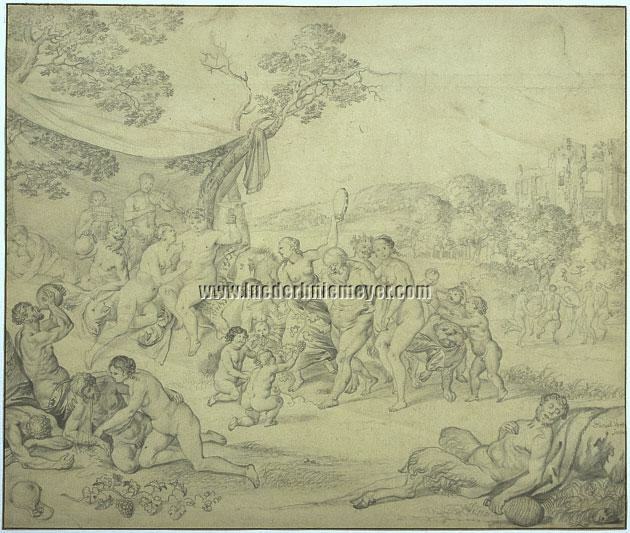 Also the sheets from the estate of Robels figure under seller no. 113, however, present Vertangen drawing under no. 7. Of Vertangen’s circumstances but little is known, particularly not if he himself had been in Italy, as with regard to the time his relation as pupil of Poelenburgh’s might let seem probable since as is known the latter stayed in Rome 1617/22, then for an extended period in Florence and returned to Utrecht only 1626/27. Sl.-S. considers it possible that Vertangen was related to Poelenburgh’s workshop before 1617 as apprentice and after 1626/27 again as assistant. Ascertained otherwise a stay in Denmark 1658, where at Rosenberg Castle still 1888 a Storm on Copenhagen was to be seen, then Amsterdam for 1673 & 1681. And “1641 and later a merchant of the same name is mentioned in Amsterdam, who states in 1655 to be 49 years old. It is possible that he is identical with the painter” (Wurzbach). An activity in Hamburg, too, is queried. for Bartholomeus Breenbergh : Landscape with ruins with Diana and her nymphs, “the Figures are by Vertangen” (Apr. 8, 1835) . (Th.-B.) as a subject cast with illustrious names with, possibly, Poussin’s ample group of drawings of bacchanals and Pan hilarity as zenith, whose Bacchanale sous une treille, Rosenberg-Prat I, 94, for instance came to mind spontaneously in spite of its mastership of gross rollicking speed while looking at the bacchanal here. as in the Netherlands of the 17th century “sort of revival. Not only that delicately drawn compositions, genre depictions, still lifes were executed on it, it served especially for portrait drawings of intrinsic value which now and then were stretched between two wooden bars in the manner of maps and mounted to the wall … Beside such vellum portraits common in all town houses also further representations on this material were esteemed as soon as they showed a neat and graceful execution” (Meder, Die Handzeichnung, 1919, page 171). Yet in such a manner they were worn in daily life just like those beautiful wall maps and grew to rarities. was intended for this, of which there are no marks yet. For apart from a not particularly suspicious diagonal fold trace in the lower part of the subject and a small further one in the white edge part above right it is of perfect freshness. Its coming into being certainly before 1660. For as already before both his co-master pupils van der Lisse and van Haensbergen, conditioned on the market Vertangen concentrated himself, too, since the 1660s exclusively on the subject of portraits. What, so Sl.-S., nevertheless is not reflected by the almost 500 paintings at the public sales documented for the period of 1630-1840, even though many portraits are preserved. Several of these only then also among the again inevitably including reiterations 637 lots in the period of 1695-1943 – dominating yet 2nd half of the 18th and the 19th centuries – comprised in the Getty Index. but just a handful drawings ! one of Vertangen’s quite scarce drawings . Just as splendid as on precious ground. illustrating two of these per 484 f. A ascertained one along with further references and same provenance as Vertangen’s present one also with Lempertz as lot 1342 of aforementioned catalog. 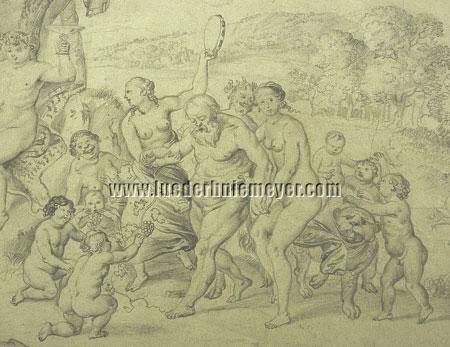 Not least quoting and/or recalling great neighborhood: Rubens’ lost Berlin Bacchanal!